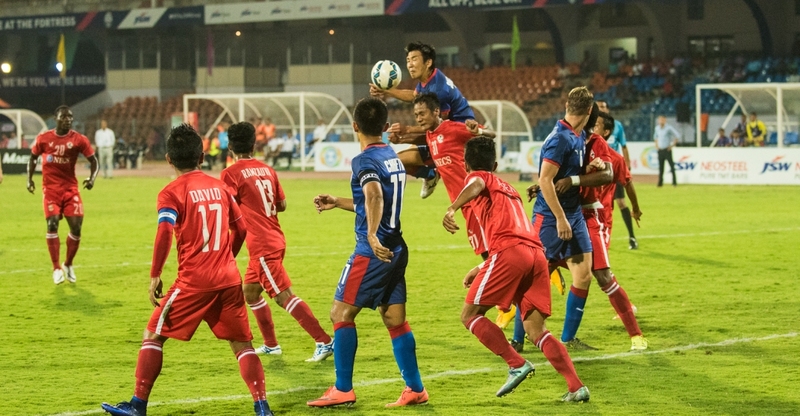 Relegated from Hero I-League, Aizawl FC, gave a reality check to the I-League Champion Bengaluru FC by defeating 3-2 at their fortress at Sree Kanteerava Stadium today, hereby ending Bengaluru’s Hero Federation Cup mission. Aizawl FC with an aggregate score of 5-3 moves to the Semi-final spot. A late kick-off ensured low turnout today, the crowd was nowhere close to the horde that turned up during the Aizawl FC’s Hero I-League away match against Bengaluru in late February. The overcast conditions ensured a pleasant weather to watch the match. Bengaluru showed confidence in fielding young mid-fielder Nishu Kumar again for today’s match. Nothing noticeable happened in the first quarter of the game other than exchanging few shots on both ends with one noticeable in the 15th minute - a good long ranger by Aizawl striker Joel Sunday, however Amrinder Singh was in the right position to collect the ball. Aizawl FC forced their first corner in the 25th minute of the game. Much to the surprise of the spectators, visitors took lead in the 26th minute of the game. An important away goal via Joel Sunday. The Nigerian, also the scorer of the 90th minute winning goal in their match at home took a pass from his striking partner Alfred Jayran, dribbled Nishu Kumar and blasts the ball to the goal. Bengaluru got an opportunity to equalize within a minute, but Kim Song’s shot failed to aim at the goal, the Korean was only few yards away from the keeper. The anguish of a missed opportunity barely lasted for a minute. CK Vineeth equalized for the host from a Keegan Perreira pass in middle of the box, a nice turn, and then he places the ball to the back of the net. It was the delightful combination of Sunday and Alfred, then Sunday’s scorcher gave the lead to the Mizoram team again, and probably taking Aizawl closer to the Semi-final spot. Jewel in the 38th minute. Luck seemed to stay away for the Blues even after changing ends. Central defender Curtis Osano quite innocuously brought down the Sunday at the top of the penalty box, referee Ramaswamy Srikrishna awarded a free kick from the dangerous position. An extremely neat chip from the captain David Lalrinmuana left Amrinder Singh stranded at the goal. That was that for Bengaluru as coming back with a 2-goal deficit looked impossible. They reduced the margin in the 74th minute from a penalty. Udanta Singh was brought down by an AFC defender and Chhetri making no mistake in placing the ball to the back of the net. Aizawl custodian, Soram Poirei Angamba, doing a tremendous job under the bar keep his opponents at bay. Also, the opponent of the Manupuri happens to be his former club, Poirei was in the Bengaluru’s roster for two seasons. Scoring a brace, Joel Sunday was adjudged the Hero of the Match.